We are pleased to announce we’ve launched a new feature which we are confident that will make your everyday communications easier. 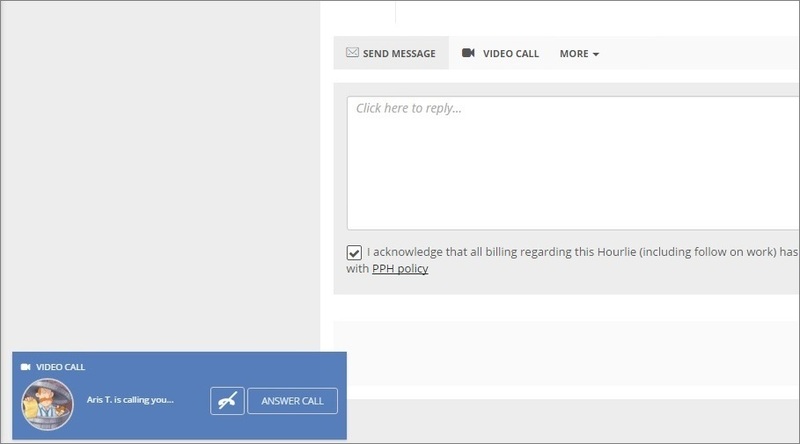 You can now initiate a video or audio call through the WorkStream with real-time texting and screen sharing features, by clicking the button shown above. In order to be able to call the Buyer or Seller they should be online. Should this be the case, they will receive a notification for an incoming call, as seen in the image below. Accepting the call opens up a chat room where you can communicate via video, audio or text. You can also arrange team meetings by adding more people to the room and share your screen to deliver your message even more clearly. As always, we’d love to hear your feedback after you give Video Call a try! Looks great Giorgos! Will definitely be using this. Now both can communicate easily…. thanking you Giorgos for making such efforts. Nice feature, I’m looking forward to trying it out! Good progress. Please don’t forget the bugs also. Great Feature…I think, It will help us everyone and as clients. Could you show a preview shot of what it looks like?? This is really helpful. Requirement discussions are quite handy now. look forward to trying this.. be great to communicate in real time! I expect this feature should be introduced for communicating with PPH support staff as well. This looks great. Keep it up!!! Awesome Feature. Will definitely try this out. A positive change. Well done 🙂 Saves us being dragged over to skype. A great feature indeed. I have seen PPH grown so much over time from a simple marketplace to an interactive and intuitive platform to get the work done. Kudoos to the people behind. Fantastic! Looking forward to giving it a whirl. It’s been long time waiting future and now is fact. This is brilliant step forward. Congrats and thanks for making our business easier. Great feature. Peopleperhour doing best work. Precious gift for us .Thank you !! Very Good feature and great work.